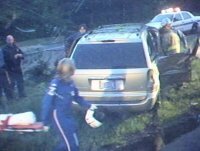 The Elwood Fire Company was called to Rt 30 just east of Elwood rd at 5:03am on May 19th for a Motor Vehicle accident (MVA). On arrival Rescue 16-4 used the Jaws of Life to extract the passenger from the vehicle while Engine 16-3 stood by with a hand line charged and provided light to the scene. Tanker 16-5 landed the helicopter in the field near Lawmans Supply. The Elwood Fire Company along with the Hammonton Fire Department participated in a Live Burn Drill at the Atlantic County Fire Academy on Sunday May 18th. Crews from Elwood and Hammonton worked together in teams for 4. 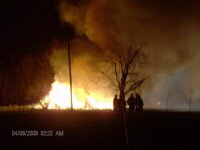 Two firefighters on the attack line and two on a back up line. Officers and safety officers watched the crews and offered tips and critique. 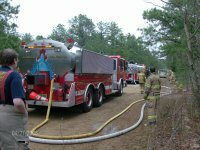 The Elwood Fire Company attended the Atlantic County Tank Task Force Drill on Sunday April 27th. Tankers from all over Atlantic County converged at the Atlantic County 4-H fair grounds supplying water for the drill. Portable ponds were set up for tankers to dump their load of water and refilled at the two draft sites. The drill finished up about 10:30am and a critique was held to discuss how things went and what could be done to improve on. Stephen Sperlak Jr recently attended a Live Propane Drill at the Atlantic County Fire Academy as part of his Fire Fighter II Training. Steve graduated Fire Fighter I in January 2008. 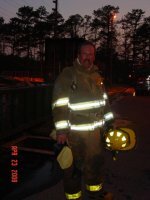 Steve is a Mullica Twp employee and is a day time fire fighter. The Elwood Fire Company was called out on April 8th at 2:00am for a fully involved structure fire at 36 Oak rd in Hammonton. Tanker 16-5 responded with a full crew to the scene to supply water and manpower. Engine 16-3 responded to the Hammonton High School to act as a water supply to incoming tankers. All units were clear at 4:19am. The Elwood Fire Company attended a Live Propane Drill at the Hammonton Fire Company #2 on Monday night. After a class on propane and it's properties, we worked as two - six man teams to suppress the burning propane and shut off the valve supplying propane to the fire. 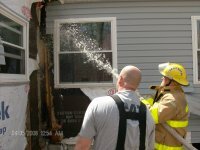 The Hammonton Fire Department conducted a joint training exercise April 7 with the Elwood Fire Company. 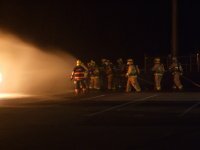 The topic of this exercise was propane firefighting and the unique challenges it presents. This drill was made possible through cooperation with Allen's Propane of Hammonton and instructors from the Alloway Fire Department in Salem County, NJ. 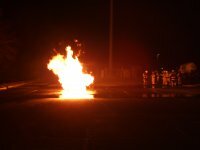 With roughly 50 firefighters attending, a live fire exercise was held simulating a propane tank on fire. The drill lasted approximately four hours with firefighters receiving a variety of both classroom and practical training. "With Suburban and Allens both in Hammonton along the border with Mullica we need to identify potential hazards. Once we identify these hazards we prepare through planning and training." said Chief Michael Ruberton. "We have a long-standing working relationship with Elwood and with Chief Tomasco's help we were able to get Allen's to donate the equipment necessary to perform the drill". Allen's propane supplied both manpower and equipment to facilitate this drill as a part of their ongoing commitment to Hammonton and South Jersey as a whole. 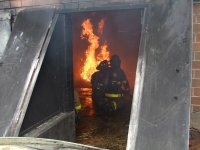 The Fire Department has several training events scheduled for spring and summer, including an April trip to the Tony Canale Training Center in Egg Harbor Township for two live fire exercises. 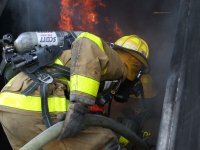 Anyone wishing to learn more about the Hammonton Fire Department or interested in volunteering can go online to www.hammononfiredept.com or call (609) 567-4300, ext. 390. The Mullica Twp Fire Companies were called on April 5th at 12:14pm to 2212 Elwood rd in Sweetwater for a possible structure fire. Sweetwater's E-16-33 arrived along with Tanker-16-5, E-16-3 and support 16-1. All other units were recalled. 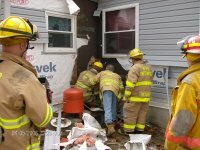 They found a electrical fire underneath the sideing on the out side of the house. The electric was turned off and the fire was put out. The units check for extension with the thermal camera. All units were clear at 12:54pm.